Study in Seville with Universidad Pablo de Olavide & TEFL International Seville! Want to spend a semester or year abroad in Seville Spain? 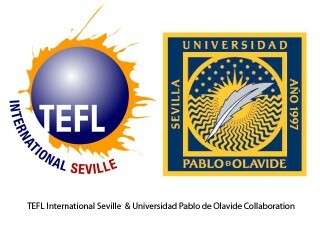 Enroll at Pablo Olavide University, get university credit, and get the TESOL Certification program through TEFL International Seville at a fraction of the cost in August! Email us at info@teflinternationalseville.com for more information. The International Center at Pablo de Olavide University currently offers a variety of programs open to students from all over the world. The most popular is the semester-long Hispanic Studies Program with courses both in Spanish and in English. The Center also offers the University Integration Program (P.I.U.) for students with advanced Spanish language skills and a fall semester only Spanish Language and Culture Program for students with lower Spanish language skills who are looking for a Spanish immersion program. Students who enroll in the August TESOL certification course are elegible for a 300 euro discount off of any of the semester programs at UPO’s International Center.